The Simplia V2 is an essential oil diffuser by nebulisation which maintains the properties of the essential oils diffused. It is powerful, simple and elegant thanks to its natural design in wood and glass. 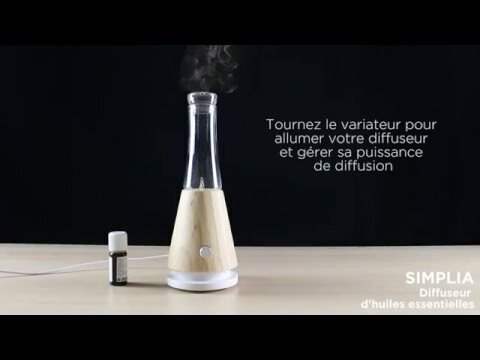 The Simplia is a diffuser that releases essential oils without heating them, thanks to its diffusion by nebulisation, thus preserving all their properties. They produce a healthy atmosphere, free of germs and microbes. This diffuser incorporates a silent air pump in its wooden base and a glass container designed to hold a small amount of essential oil. Thanks to its nebulisation technology, the micro-droplets are distributed across a room of up to 100m² for several hours. The diffuser has a diffusion power controller to adapt its use to the size of the room and to suit your desires. Position the wooden base and glass container. Pour a few drops of essential oil into the diffuser.